12 January 2017. A team at National Institutes of Health used an electronic-aided process to carry out a gene editing technique that in lab mice repaired a genetic defect causing a rare blood disease. Researchers from National Institute of Allergy and Infectious Diseases in NIH and the cell technology company MaxCyte Inc. in Gaithersburg, Maryland describe their work in the 11 January issue of the journal Science Translational Medicine (paid subscription required). The NIH-MaxCyte team applied Crispr gene editing techniques to a disorder known as X-linked chronic granulomatous disease, an inherited condition where phagocytes, white blood cells in the immune system, do not produce the proteins that protect against invading pathogens, such as bacteria and fungi. Chronic granulomatous disease is a rare disorder, but those with the condition face repeated serious infections in the lungs and other tissue, requiring regular courses of antibiotics and other drugs. The condition is caused by a mutation in the cytochrome b-245 beta chain, or CYBB gene that leaves phagocytes without their normal pathogen-fighting ability. This genetic defect prevents production of NOX2 proteins needed for phagocytes to do their work. To correct the defect, the researchers used the emerging gene-editing technique called clustered, regularly interspaced short palindromic repeats or Crispr, a technology based on bacterial defense mechanisms that harness RNA to identify and monitor precise locations in DNA. The actual editing of genomes with Crispr uses an enzyme known as Crispr-associated protein 9 or Cas9. With this approach to Crispr, RNA molecules guide Cas9 proteins to specific genes needing repair, making it possible to address root causes of many diseases. The team took blood-forming stem cells from individuals with X-linked chronic granulomatous disease, in which they performed the gene editing. 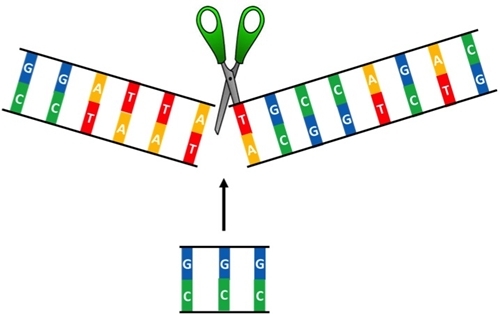 Crispr-Cas9 edits are usually performed with benign viruses to carry the genetic fixes. To reduce the risks of errors leading to toxicity or other complications, the NIH researchers first employed electroporation in the target cells, where an electric field weakens the cell membranes, making it easier and faster for messenger RNA and a genetic correction template to enter the stem cells and make the fixes. MaxCyte Inc. provided the electroporation technology. The team cultured the gene-edited blood forming stem and progenitor cells in the lab to produce sufficient quantities for grafting on lab mice induced with the immunodeficiency causing the human chronic granulomatous disease. The corrected stem and progenitor cells in the grafts produced mature functioning white blood cells in the mice for 5 months. Sequencing the mice’s whole exomes, the part of the genome producing 85 percent of disease-causing genetic alterations, showed no edits to other genes, other than the CYBB gene targeted for edits. The researchers plan to advance this technology further into a clinical process for treating X-linked chronic granulomatous disease, and perhaps other inherited blood disorders. One of those disorders is sickle cell disease that affects a much larger number of people.